Tamaki Honda, a first year high school student, joins the peculiar SNS Club. With nothing but her wits and her artistic skills, she must traverse the world of doujin (self-published) game development. As new issues arise within the development of game making, Tamaki learns more about her club member’s odd personalities. Tamaki has just started high school and is trying to find her passion in life. Finding a club to join is not as easy as it looks. Tamaki gets more comfortable with the girls, but there is still an underlying shyness that keeps her from showing them her art. Ayame is still struggling to come up with a story for the game. As a stress reliever, they decide to do a club outing for Golden Week! Tamaki is told that her characters are lacking genuine expressions. Meanwhile, as she ruminates on how her art, she is approached by her upperclassman. Tamaki comes down with a cold. 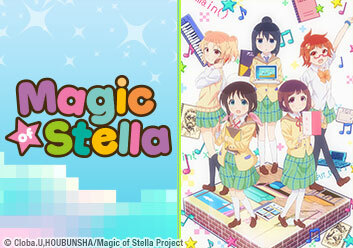 As the group signs up to another event, the girls work overtime to finish their game "Magic of Stella." The girls are doing their exhibition, and they're excited. Shiina, in her agitation, starts to get sick. As they’re promoting no one is stopping at their booth. Kyo asks Tamaki for her help in writing some song lyrics. This leads Tamaki to believe that Kyo is in love and wishes to help. Tamaki is confronted by a spirited girl. As a member of the Illustration Club, the girl challenges Tamaki to a duel among artists. Tamaki finds herself in an art slump and can’t seem to shake it off. Sensing something is wrong, Ayame attempts to cheer her up. Tamaki gets a makeover. Meanwhile, she accidentally drops Shiina’s laptop and tries to build up the courage to confess to her. After Minaha is forbidden from partaking in club activities, Tamaki and Ayame try to convince her family to let her participate. The girls promote their game at Summer Comiket with some interesting results. Afterward, they head to the beach in celebration.